The latest issue of Public Sector Digest includes an article from ACT! ACT’s Senior Researcher, Edward Nichol, writes about low carbon resilience in Canadian municipalities. He emphasizes how municipalities are at risk from a variety of current and future climate change impacts, and that these risks affect the built and social infrastructure within municipalities – the buildings, transportation networks, energy systems, telecommunications, and water treatment systems, and the people that depend on them. Green infrastructure is critical to protect the well being of communities and to ensure social, environmental, and economical sustainability in an uncertain climate future. Read the article here, beginning on page 16. The National Climate Change Adaptation Research Facility (NCCARF) in Australia is inviting abstracts for their Sixth National Climate Adaptation Conference, May 8-10 in Melbourne. Climate Adaptation 2018 is the major Australian forum focused exclusively on climate impacts and adaptation. In 2018, NCCARF is partnering with Engineers Australia to incorporate Practical Responses to Climate Change. Abstracts will be accepted until February 2, 2018 for presentations at the conference. Pathogens cause diseases of forest trees and the environment plays a critical role in regulating the disease process. It is expected that trees will be affected by future climate conditions, but how will future conditions affect the interactions between trees and pathogens? In this talk, Tod will outline potential changes in disease processes by closely examining how environmental conditions affect the life stages of foliar, rust, and root diseases as well as decay agents. He will also discuss potential adaptation strategies that can be utilized to mitigate the impacts of climate change on forest trees and potential forest pathology issues associated with assisted migration. Tod Ramsfield received his PhD from the University of British Columbia in Forest Pathology under the supervision of Professor Bart van der Kamp in 2002. From 2002 to 2010, Tod was employed by Scion (the New Zealand Forest Research Institute Ltd.) where he worked on DNA-based detection of forest pathogens that were of biosecurity concern to New Zealand. In 2010, Tod returned to Canada to work for the Canadian Forest Service in Edmonton, Alberta. Current projects include silvicultural control of Armillaria root disease, soil microbial community assessment in natural and reclaimed areas around Cold Lake and Fort McMurray, heart rot of aspen caused by Phellinus tremulae, and Dothistroma needle blight. Tod also maintains an active interest in invasive forest pathogens and is the leader of IUFRO research group 7.02.00 – Forest Pathology. 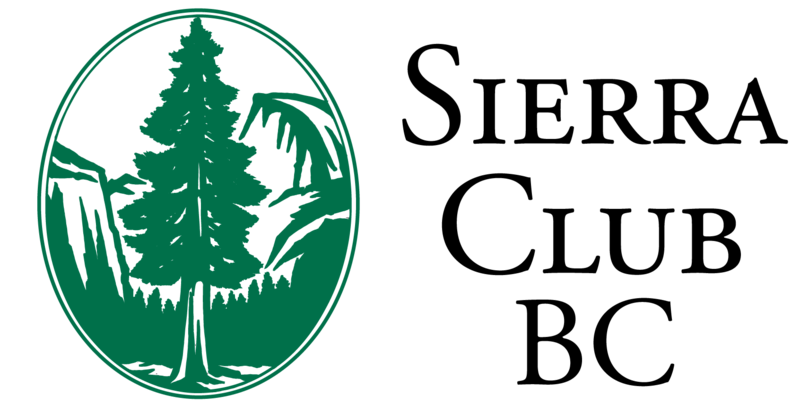 Sierra Club of BC Foundation is a non-profit environmental and social justice organization whose mission is to defend British Columbia’s wilderness and ecosystems, within the urgent context of global climate change. We advocate for the responsible use of B.C.’s natural resources while promoting a modern, equitable economy that sustains our planet in every way. Sierra Club BC works with First Nations and other levels of government to provide science-based advice on policy decisions that affect a range of environmental issues. Based in Victoria, B.C., we are a dynamic and influential organization. Learn more at www.sierraclub.bc.ca. This is an opportunity to help take B.C.’s oldest environmental non-profit to the next level of influence and effectiveness. As Executive Director, you are a highly experienced, strategic leader with a proven track record in senior management. You can especially demonstrate consistent success in fundraising. You have a clear commitment to upholding Indigenous title and rights, ideally reflected in a proven understanding of Indigenous and colonial history, and a demonstrated track record working in solidarity. You are able to work with people from diverse backgrounds and engage constructively with a wide range of stakeholders, including funders and donors, First Nations, scientists, industry, environmental and social justice organizations, senior public servants and elected officials. You hold compelling communication and interpersonal skills, are an effective motivator and coach, and are adept at media relations. The Executive Director reports to the Board of Directors and collaborates with a Management Team that is responsible for overall strategic direction and overseeing operations, including fiscal management, fundraising, campaigns and programs, digital systems and engagement, communications, and human resources. Lead and collaborate with the Development Team to develop and implement a strategy that achieves ambitious multiyear targets to strengthen the organization’s impact on the world. Targets will include significant expansion of membership base, delivery of a major capital plan in association with Sierra Club BC’s 50th anniversary, and growing foundation funder support. Develop and oversee the annual budget and monitor/manage financial performance. Ensure that appropriate financial systems and controls are maintained to meet the needs of the organization and its funders. Fundraising and financial management will be a major focus of the successful candidate’s time. Collaborate on ongoing development of the organization’s strategic plan and oversee its successful execution. Oversee the effective planning, implementation, management, and evaluation of the organization’s operations, campaigns, and programs. Ensure the organization’s IT systems and digital strategies are optimized to support all aspects of Sierra Club BC’s success. Collaborate with the Management Team, and in particular the Campaigns Director, to plan and execute new programs, campaigns or initiatives to address emerging needs and opportunities. Ensure a robust approach to staff recruitment, retention and performance management. Oversee staff development, training and mentoring. Promote equity, diversity and inclusion. Ensure respectful, collaborative relationships among all parts of the organization, including staff, Board and volunteers. Represent Sierra Club BC in media, and through public speaking engagements. Work with Communications Director to implement effective strategies for external communications, including media relations, digital communication and other communications touch points. Collaborate with Management Team to develop and implement a results-oriented government relationship strategy. Salary is $84,064 to $89,914, subject to experience and qualifications. We offer a generous vacation allowance and a solid benefits package. Some travel is required, especially to the Lower Mainland. Occasional weekend and evening work as needed. Sierra Club BC is an equal opportunity employer. We encourage women, people of Indigenous ancestry, people of colour, LGBTQQIP2SA individuals and members of other diverse communities to apply for careers with our organization. Submit CV and a statement of interest, with the words “Application for Executive Director” in the subject line, to Sierra Club BC Office Manager Lynn Bakken at lynn@sierraclub.bc.ca. No phone calls please. To enjoy the earliest consideration for this position, please submit by January 5, 2018. Today the report Getting to 2050: Citizen Recommendations was released. 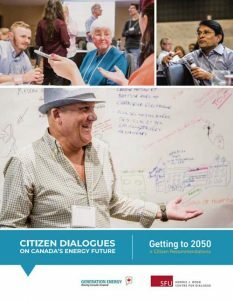 This report contains the results from the Citizen Dialogues on Canada’s Energy Future, a major initiative of the SFU Centre for Dialogue. The project marks the first ever cross-Canada deliberative dialogue where randomly selected citizens have advised the Government of Canada on energy policy. It was funded by Natural Resources Canada as part of the Generation Energy initiative. The Government of Canada has launched Canada in a Changing Climate: Advancing our Knowledge for Action, the national assessment of how Canada’s climate is changing, the impacts of these changes and how we are adapting to reduce risk. The process to develop the assessment is an ongoing collaboration among subject-matter experts from a range of backgrounds. Together, they will consider scientific and technical literature, Indigenous knowledge and practitioner experiences to build our understanding of the impacts of climate change and the ways we can adapt. Watch for a series of authoritative science and knowledge products over the next four years. A strong assessment process includes all relevant information and knowledge, including your views, documents and expertise. Share what’s important to you about climate change impacts and adaptation in Canada. Joel R. Nodelman, Nodelcorp Consulting Inc.
A first-order evaluation of the types of adaptation measures that could be used to help manage severe weather and climate change-related risks across a broader set of transmission system segments. Conducted over the 2013-2015 time period, the study was overseen by the Power System Planning staff of the Ontario Power Authority, since amalgamated with Ontario’s Independent Electricity System Operator (IESO), and made use of the Public Infrastructure Engineering Vulnerability Committee (PIEVC) Protocol, an Engineers Canada-developed engineering vulnerability assessment tool. The flood, drought and fire extremes of 2017 provide both the backdrop and a focus for the Blue Ecology Workshop on November 28th in Richmond. It need not be doom and gloom. There is hope for future generations – especially if we take a water-first approach to setting priorities. The process for adapting to a changing climate starts with an attitude change. Actually adapting requires transformational changes in how we apply hydrologic understanding, value nature, and service land – this is a unifying theme for the Blue Ecology Workshop. Designed to be a conversation starter, the Blue Ecology Workshop will have a town-hall format to create a ‘sharing & learning’ atmosphere for interaction between the audience and the presentation team. Michael Blackstock will be joined by two ‘water champions’ who have achieved national prominence – Member of Parliament Fin Donnelly, who has twice swum the length of the Fraser; and the CBC’s Bob McDonald, host of Quirks & Quarks – along with a supporting cast from the Partnership for Water Sustainability in British Columbia. Emerging policy and regulatory guidance are relevant, but professionals also need to be aware of common law duties and potential liability. Both negligence and nuisance claims may arise as a consequence of professional advice that does not take into account climate change. At the same time, as well as risks and obligations, climate change offers opportunities for greater collaboration across professions, and a strong role for professionals in supporting community and ecosystem resilience. Infrastructure projects that incorporate green design elements and natural assets may offer greater flexibility and less risk of catastrophic failure, and can be achieved with interdisciplinary expertise. Managing the uncertainty around future climate impacts is also an area where professionals can work with climate scientists to better understand the local implications of different climate scenarios. Deborah Carlson, staff lawyer with West Coast Environmental Law, a not-for-profit organization, works collaboratively at the local level on law and policy for resilient, healthy communities. She focuses on community-based approaches that recognize our vital connection to nature, and respectful relations with Indigenous Peoples. Her work looks at formal and informal ways to overcome jurisdictional gaps for more integrated policy and regulation at natural scales, recognizing the contributions of professionals and community organizations. Deborah has partnered with the Adaptation to Climate Change Team at Simon Fraser University to develop and deliver community engagement and urban green design workshops. She holds civil and common law degrees from McGill University and is called to the BC bar, with two decades of experience, first practising litigation in private practice and then working for environmental organizations. The City of Vancouver has launched a new resource this year – a crowdsourcing tool to document high tide shoreline photos. A mobile-enabled website that allows citizens to contribute to our shared knowledge about the shoreline. The City is inviting citizens to capture photos of the shoreline at high tide and upload them to Vancouver.ca/kingtides, providing critical information to help the City better understand and prepare for the impacts of sea level rise. King Tides, when sea levels reach their highest point in the year, are coming soon. By collecting data along the shoreline, people will help visualize what normal sea levels may look like in the future as sea levels rise due to climate change. Snap the shore. Take the lead as a citizen scientist and help the City seed their brand new site with helpful shoreline data. Upload it right away to Vancouver.ca/kingtides – you can do this straight from your phone (turn on GPS). Get the word out. Spread word about the app through your contacts and social networks. Share your photos on social media, using the app. Thank you for helping the City to get this important project off the ground. For more information about how the City is planning for sea level rise, click here. If you have further questions about the project, feel free to reach out to tina.barisky@vancouver.ca. If you’re in the Prince George area, check out this interesting upcoming event. A webcast is available as well. Climate change is a threat to ecosystems and human communities across the globe. Some climate change adaptation strategies have the potential to generate additional risks and vulnerabilities (e.g., geoengineering, desalination). However, instead of taking the proverbial political ecology ‘hatchet’ to critique these strategies, this talk focuses on the ‘seeds’ of more equitable adaptations that account for the needs of the human and more-than-human world. Innovative case study examples from the Upper Missouri Headwaters region in southwestern Montana, USA – where climate change is affecting snowpack and altering the quality, quantity and timing of water runoff – will be discussed. Opportunities and challenges for implementing natural water storage, ‘shared sacrifice’ agreements, and drought plans that account for ecological and human impacts will be highlighted. 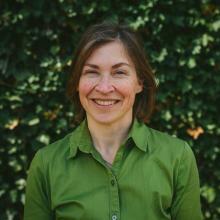 Bio: Dr. Jamie McEvoy is an assistant professor of Geography at Montana State University. As a human-environment geographer, her expertise is in political ecology, human dimensions of water resources, and climate change vulnerability and adaptation. Her recent research focuses how individuals and communities prepare for both droughts and floods. She has conducted research on perceptions of water quality associated with oil and gas development in eastern Montana, USA, public participation in water planning along the Yellowstone River, the impacts of desalination as a sociotechnical system in northwestern Mexico, and the feminization of agriculture in southwestern Mexico. She is honored to be a speaker at the 2017 Inspiring Women Among Us Conference. weADAPT, the Stockholm Environment Institute (SEI)’s global platform and network for climate change adaptation issues, is marking its 10th anniversary in 2017. Since it was created by the SEI Oxford Centre in 2007, weADAPT has become a signature online “open space” that allows practitioners, researchers and policy-makers from around the globe to access credible, high-quality information, and to share with one another the experiences and lessons from the frontier of climate adaptation work. This important milestone is a reminder that ACT has been at the forefront of this research. Having also recently celebrated its 10th anniversary, ACT was founded on a basis of providing evidence-based, in-depth adaptation resources to decision-makers. We continue to research and develop critical top-of-mind climate change and environmental topics, particularly related to holistic resilience approaches to policy and planning. ACT is proud to be part of a growing community of adaptation and resilience thinkers who are committed to creating a sustainable world for all. See more of weADAPT’s work and impacts here. Canada’s Climate Change Adaptation Platform, chaired by Natural Resources Canada (NRCan), brings together representatives from industry, Indigenous, municipal, professional and not-for-profit organizations, federal, provincial and territorial governments, and research institutions to address shared adaptation priorities. To support the objectives identified by Adaptation Platform working groups, Natural Resources Canada is soliciting proposals for cost-shared projects that address climate change adaptation in the areas of coastal management, energy, mining, economics, infrastructure, forestry and training. Funding for this Call comes from NRCan’s Climate Change Adaptation Program. Up to $8.25 million in funding may be awarded through this process. Projects should have a start date no earlier than March 1, 2018. The duration of the project should be based on the scope of the work. Unless an earlier date is specifically indicated in Annex 1, projects must be completed no later than November 30, 2020. This call for proposals is focused on projects that can achieve results with broad impact. The federal government may fund up to 50% of the total cost of a project. Projects are expected to provide matching support, either cash or well documented in-kind contributions from sources other than the federal government. Letters of support from these sources that confirm the nature, amount and timing of their contributions must be included with the proposal. Projects requesting less than $100,000 of NRCan funding will not be considered. For more information and to download the Call for Proposals, click here. Deadline for submission of proposals is November 27, 2017. 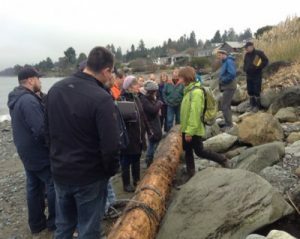 Responding to local governments who are interested in bringing Green Shores to their communities, this webinar will outline a framework (including Shoreline Classification, Official Community Plan policies and objectives, Development Permit Area guidelines, and Zoning provisions) to organize local government action and support implementation on the ground on public and private land. This webinar will highlight key points from the “Green Shores Policy and Regulatory Tools for Local Governments” guidebook, which has been recently updated. Considerations related to a changing climate, including the impacts of sea level rise and more extreme weather events will also be flagged. 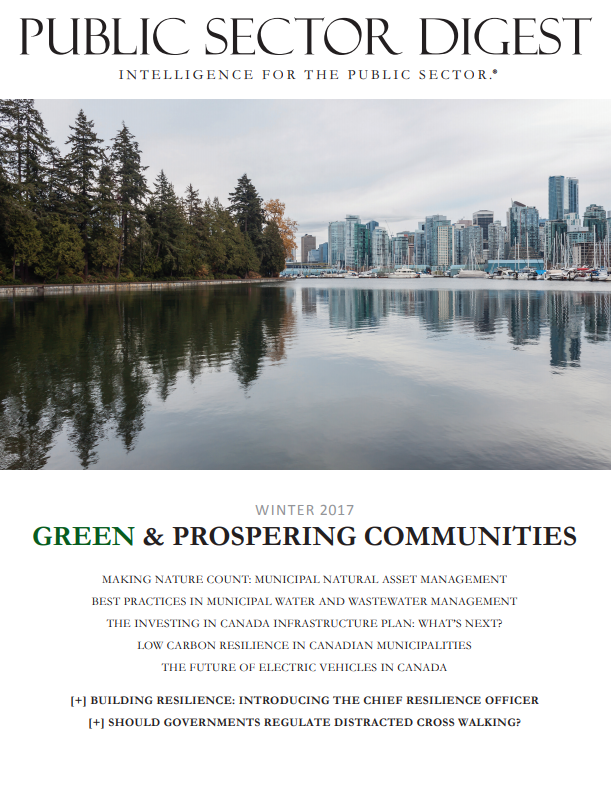 A case study of local government action in the Powell River Regional District will share lessons learned, and information about how local governments can join a BC Green Shores working group will be provided. Local governments are confronting one of the most important issues of our time – the alarming recent increase in damage to homes from extreme rainfall. Communities large and small across Canada are now taking action to reduce the risk of basement flooding and damage to property from sewer backup. The Institute for Catastrophic Loss Reduction (ICLR) wrote a book titled Cities adapt to extreme rainfall: Celebrating local leadership that presents 20 of the many successful local projects underway in communities that are adapting to better address the risks associated with extreme rainfall. During this webinar, Sophie Guilbault, Manager at ICLR, will review some of the case studies presented in the report as well as lessons learned. In recent years, severe rainfall has replaced fire to become the leading cause of damage to Canadian homes. Damage to homes from sewer backup and basement flooding now exceeds $2 billion a year, and has been rising at an unsustainable rate for more than 25 years. Moreover, it is inevitable that the frequency and severity of extreme rainfall events will escalate as a result of climate change, threatening to further increase the damage to homes unless we adapt. Much of the damage to homes is preventable if local governments and homeowners apply existing knowledge to the design and maintenance of buildings and infrastructure. Fortunately, local governments, property owners and other stakeholders are starting to take action. Over the next few decades, it is expected that Canadians will experience more frequent and intense rainstorms. Nevertheless, if we adapt, it is possible that we could also experience reduced stormwater damage to homes.